Welcome this stationary sofa in your living room or family room for cozy seating. This 72 inch sofa features two plump seat cushions, slightly flared teardrop-shaped arms and wood block feet. Customize the look of your sofa with the choice of fabrics available by special order. This stationary sofa is available in 80 inch and 72 inch sofas options. The 2200 Stationary Short Sofa with Block Feet by Lancer at Westrich Furniture & Appliances in the Delphos, Lima, Van Wert, Ottawa, and Celina area. Product availability may vary. Contact us for the most current availability on this product. Incorporate a casual design with modern accents into your home with the 2200 series. 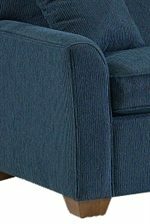 This collection features a variety of sizes of sofa sleepers and stationary sofas, as well as other upholstery options to create a comfortable seating arrangement in your living room or family room. Flair tapered, teardrop arms and exposed wood block feet add just the right amount of stylish detail. With a variety of fabrics to choose from by special order, you can create a design that fits your home perfectly. Coordinating pieces also available include an upholstered chair, ottoman, 3/4 (Twin) sleeper and loveseat. The 2200 collection is a great option if you are looking for Casual furniture in the Delphos, Lima, Van Wert, Ottawa, and Celina area. Browse other items in the 2200 collection from Westrich Furniture & Appliances in the Delphos, Lima, Van Wert, Ottawa, and Celina area.